Since 1970, Earth Day has provided a platform to raise awareness about environmental sustainability, has acted as an opportunity for educational experiences, and has promoted a call to action to protect the planet. Today, Earth Day is a worldwide campaign supported by millions of people in 192 countries working together to fight for a clean environment. On Earth Day 2018, staff from Arizona State University’s LightWorks attended EarthX and presented the latest research and technologies that address today’s climate change issues. EarthX is the world’s largest Earth Day expo, where people gather to share ideas and solutions from all over the world. 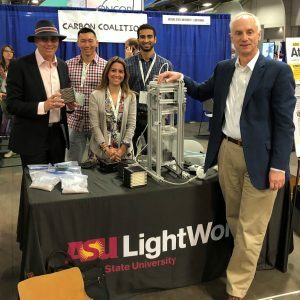 LightWorks, in association with ASU’s Center for Negative Carbon Emissions, participated in the Clean Capitalism Challenge Panel hosted by EarthX. Scholars discussed with organizations from across the country an outline of an efficient, pro-business, pro-growth clean tax code that can tilt the playing field in the direction of cleaner, more efficient solutions to transform capitalism into clean capitalism. Watch the highlights on the Julie Ann Wrigley Global Institute of Sustainability's YouTube channel.